· 域：域是需要被保护的数据库schemal、对象、角色的一个功能上的集合。例如：你可以将和账户、销售、或者人力资源相关的数据库schemal、对象、角色组成一个域。当你将这些组成一个域后，你可以使用域来控制赋给特定账户或者角色的系统权限的使用。这样你就可以给任何想使用这些数据库schemal、对象、角色的用户提供细粒度的访问控制。Chapter 4, "Configuring Realms" 详细讨论了域。. · 命令规则：命令规则是一个特殊的规则，通过这个规则，你可以控制用户如何执行他们能够执行的几乎所有的SQL语句，包括SELECT, ALTER SYSTEM, database definition language (DDL), 和data manipulation language (DML)语句.命令规则必须和规则集一起决定某个语句是否允许执行。Chapter 6, "Configuring Command Rules" 详细讨论了规则集. · 因素：因素是一个命名变量或者属性，例如用户位置、数据库IP地址、会话用户，这些因素是Oracle Database Vault能够识别和保护的。你可以针对用户活动使用这些因素，例如授权数据库账户链接到数据库，或者创建过滤逻辑条件来限制数据的可见性和可管理性。每个因素可以包含一个或者多个标识，标识是因素的具体的值。一个因素可以包含多个标识，这取决于因素的检索方法或者它的映射逻辑。Chapter 7, "Configuring Factors" 详细讨论了因素. 为了加强这些组件的功能，Oracle Database vault提供了一系列的PL/SQL接口和包。"Oracle Database Vault PL/SQL Interfaces and Packages" 提供了一个概括的介绍. 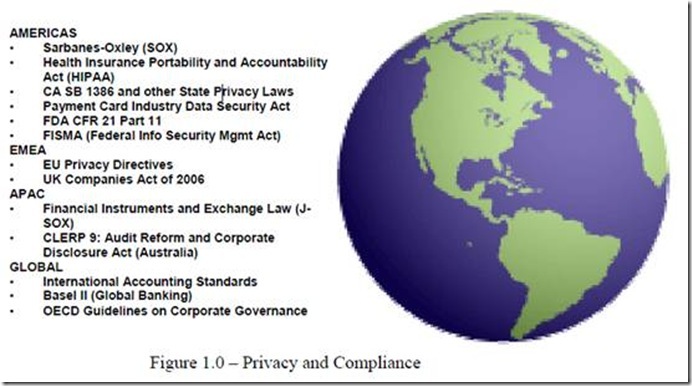 Chapter 4 到 Chapter 9解释了如何通过Oracle database Vault管理员程序来配置访问策略, 以及如何将Oracle Database Vault与其它Oracle产品集成起来. 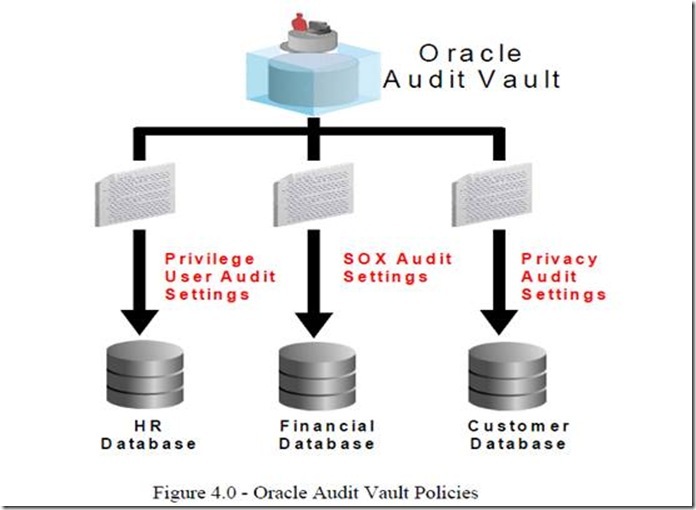 Chapter 16, "Oracle Database Vault Reports" 解释了Oracle Database Vault报告. 为了执行维护任务，可以使用命令行工具Oracle Database Vault配置助手(DVCA).更多信息请参考Appendix C, "Postinstallation Oracle Database Vault Procedures". 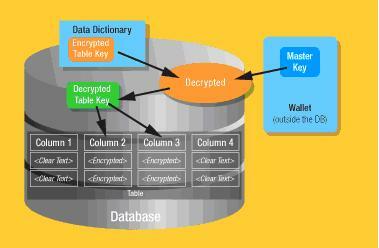 Chapter 10, "Oracle Database Vault Objects" 详细描述了这两个schema. 参考Chapter 14, "Using the Oracle Database Vault PL/SQL Interfaces" and Chapter 11, "Using the DVSYS.DBMS_MACADM Package"获取更多信息. 参考 "Integrating Oracle Database Vault with Oracle Label Security" 获取更多关于Oracle Database Vault和Oracle Label Security如何配合的信息. 参考 Oracle Label Security Administrator's Guide 获取更多关于Oracle Policy Manager的信息. 参考 Chapter 16, "Oracle Database Vault Reports" 获取更多关于你可以生成的报告的信息. 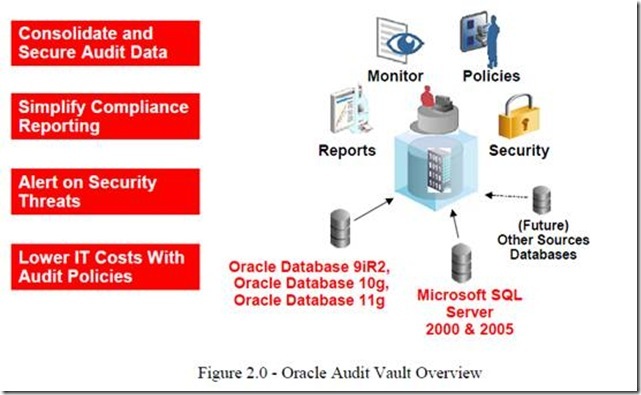 Chapter 15, "Monitoring Oracle Database Vault" 解释了如何监控Oracle Database Vault. · 应用数据访问的职责分离: 这种情况下，由Oracle Database Vault 创建的，FIN域拥有者，能够访问FIN域的schema. 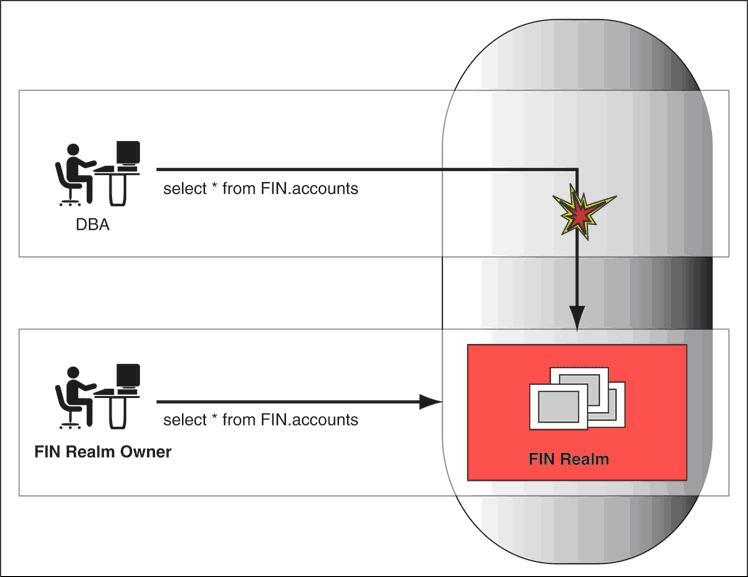 Description of "Figure 1-1 Oracle Database Vault Security"